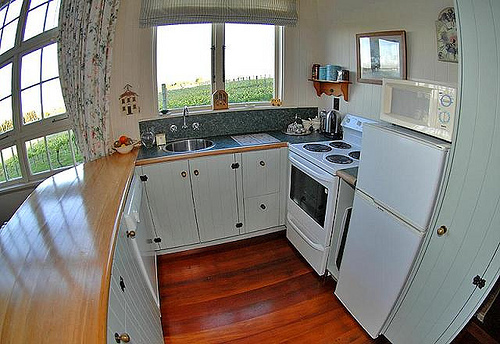 New Zealand Accommodation - what does "self-contained" really mean? New Zealand Accommodation – what does self-contained really mean? Home Travel Blogs New Zealand New Zealand Accommodation – what does self-contained really mean? New Zealand Accommodation – what does self-contained really mean? We get asked this question a lot. International travellers are surprised to find, that even standard accommodation has basic kitchen facilities – this works well for those don’t want to eat out every day. Smaller kitchenettes are pretty standard and usually include the basics like a micro wave oven, eating utensils and a pot or two. Now for some people, that’s enough, but what if you require a little bit more? This photo shows a full kitchen at The Old School House at Kina Beach. This is a gorgeous little honeymoon cottage located smack bang in the middle of a vineyard. There are no shops or restaurants nearby. Honeymooners just want to whip up a simple meal or platter and enjoy the intimacy. And depending on your budget, there are many levels of apartments to choose from. Stand-alone luxury retreats provide very attractive stay-in options – this pretty much always have a gourmet separate kitchen with sophisticated equipment such as coffee and bread-making machine. You’ll also get a great choice of state-of-the-art pots, pans, bone china, quality cutlery and of course a wall-mounted oven with full gas hobb. See what I mean? 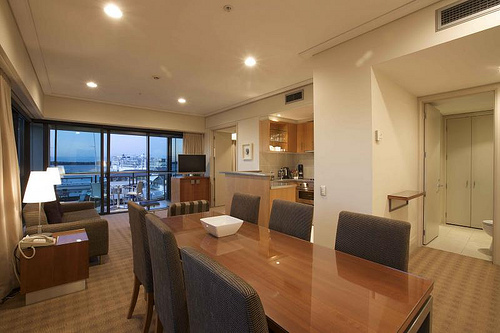 New Zealand Accommodation – what does “self-contained” really mean? – well for most of us, it means being about to sleep in to whatever hour you want. It also means not having to come down to breakfast with ‘bed hair’ or having to converse with other travellers. A quiet breakfast with just the one you love is a very gentle way of starting a new and exciting day of travel!